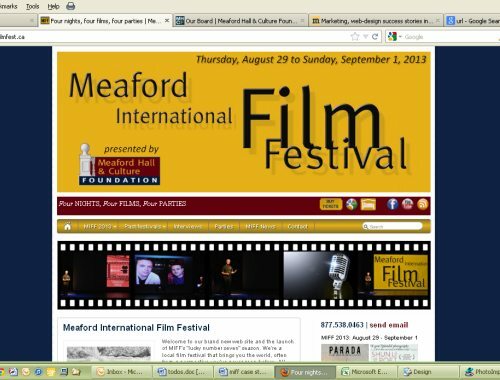 Since 2007, Meaford, Ontario has had its own International Film Festival, affectionately known as MIFF, which treats festival goers to “four nights, four films, and four parties” every Labour Day weekend. This year, the festival features works from South Africa, Serbia, France, the U.S. and Italy, as well as homegrown shorts by young Grey-Bruce filmmakers. And as MIFF kicks off its seventh season, the festival has also launched a brand new website, developed by myFavoriteMarketer, which offers a rich source of information on this year’s films; films and special guests from years past; and an opportunity for more recognition of volunteers and sponsors. For its first six years, MIFF had launched a new website at a new domain each year, with details on the current year’s films and guests. This approach had its drawbacks. Beyond the additional work involved in setting up a new domain and new website every year, it diluted search engine rankings and confused ticket buyers. As old websites disappeared, links from media and other listings went bad, and any ranking the site had built up disappeared. Each year’s website had to start all over from scratch. Meanwhile, ticket buyers might assume from a dead link that the festival had folded, or if the old site was still up, they might happen upon the previous year’s films. It also made it difficult to maintain an ongoing archive of past films, special guests and other festival highlights. Recognizing this, the Meaford Hall & Culture Foundation (MHCF) turned to myFavoriteMarketer to create a single, ongoing website which would consolidate the archives and establish a long-term Internet presence. We worked closely with the MHCF, who provided ideas, input, some design direction and graphics, and with Thomas, to fashion a user-friendly, information-rich site. Among the new suggestions and features myFavoriteMarketer built into the website were. Restoring and redirecting the previous year’s domain name. 2012’s domain, miff12.ca, had recently expired, but a number of media outlets, including the CBC, had links pointing to this URL. By renewing and redirecting the URL to the new website, we kept those links, along with any visitors who might find them. Archives of all past films by year. 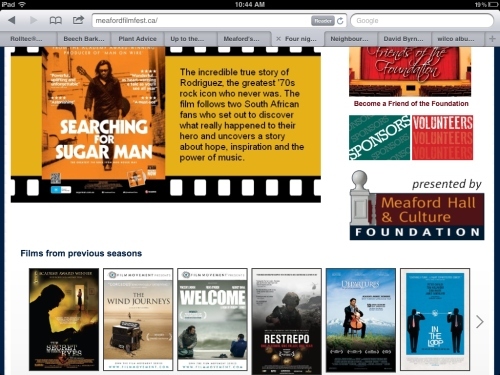 MIFF’s archives demonstrate the festival’s character and quality. Now, visitors can scroll a touch-screen friendly carousel of posters to view a past film’s description and trailer by title, or they can choose a year, and link to any of the films shown that year. A blog. Built in WordPress, the new MIFF website allows organizers to post their own articles in any number of categories, including the overall “news” category. This allows for frequent updates and expanded search results for the festival. Numerous videos. After all, this is a film festival. In addition to trailers for each film, past and present, the site features student videos, and at least one MIFF-produced video, for which we established a MIFF YouTube channel.